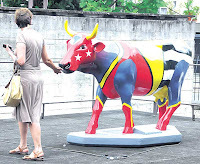 The outdoor exhibition CowParade is already around the city to celebrate the 456th anniversary of Sao Paulo (January 25th). It will be about 90 cows customized by artists at this time. Many of them are inspired by the chaos of the capital. Recurrent themes in the life of São Paulo, such as traffic, rain, biking and selective collection, served as the basis for some sculptures. Every artist has a different view of the city. While some see problems, others see solutions. The fun cows are installed at various points, such as Avenida Paulista, Rua Oscar Freire, Brigadeiro Faria Lima and many other points. The process of selection of the artists was made in September, when they were chosen projects submitted by graffiti artists, architects and designers. The organization has also invited 13 people from other areas. Initially scheduled for November 2009, the show has ran for 55 cities, including New York and Tokyo. The exhibition is in the state capital until March 21. The cows will be auctioned after the exhibition period and the income will be donated to the Foundation called Gol de Letra (responsable for education program for child).